Posted in Uncategorized and tagged animation, iron man, movies, pixar, up!. First! jaja i want to see tht movie. 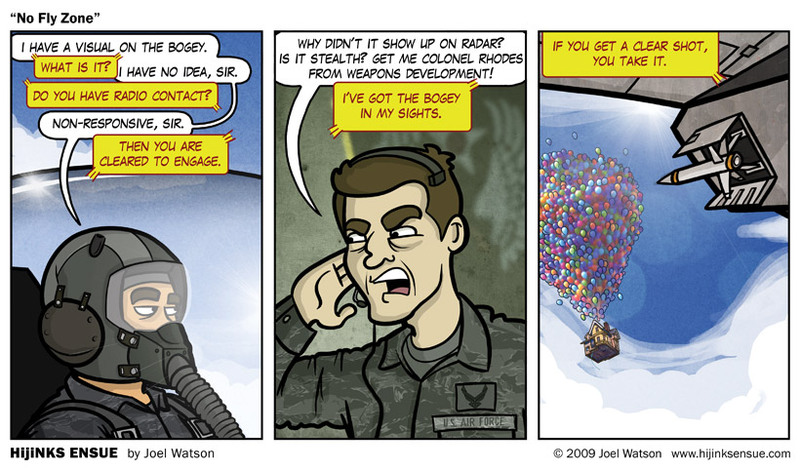 Also this comic is full of win, but i dont like the radio text ballons, neither the color or the shape. I think they work quite well as I knew exactly what they were as soon as I read the first one. Gosh, that was a bit 'teacher's pet' of me wasn't it?! Toff-toff-toff-guffaw-guffaw-toff. I only understood that it was a reference to Iron Man due to the related post links. Either way, how did you do those balloons? I'm guessing you had a smarter way than one by one. Man, I really want to see this movie! the comic does bring to mind quite a few interesting questions about what would happen if UP! were possible. like what? I bet this will make a GREAT reply tree. I think if you built the house on a metal frame foundation with a beam up the middle to connect the balloon to it might be plausible if pointless. I keep thinking of the guy who flew in his lawn chair with helium balloons. Like, what happens when you flush the toilet…? Where does all that shower water go…? Where do you put the rubbish? Does a balloon-lifted rubbish van (sorry, garbage truck) come and take it away every tuesday at 6:52 am? Is (and this is the big one) the TV reception any better what with you being so much closer to the satellites now? Where does the dog go to the bathroom? Does he just piss up the side of a potted plant? Or, with an amazing degree of forethought and splendid planning, have you toilet trained it already? Any more… Nope… But I'm sure I'll think of some while I'm at work! Just a couple of things I've thought about already this morning! The more important question about shower water is where is it coming FROM in your hypothetical situation? Rainwater collected on the roof and heated by a dragon. Obvio. Wow, Joel, the comic looks amazing! I will definitely be buying a print when I get some money. So Up! was good then? That seems to be the general consensus. I may have to go see it then. Very nice – art is lovely. Went to both Iron Man and "Tomorrow Is Yesterday"! Last panel could be fun for a t-shirt, too! No way could Joel risk the copyright infringement. I don't think Pixar has the EXACT copyright on a house with balloons coming out of it, but it's risky enough. I bet he could market it under parody. Stupid Disney and their copyright geshtapo! Gnyaargh! I really want to see this movie but some bloody brilliantly clever chap ('retardus maximus' as I think the original latin goes) has decided that it would be a spiffing idea not to release it in blighty until f**king October!!! WTF is up with that?! Either way, LOVE the comic! Nice work on the house, must have taken ages! I saw this comic and this was the first thing that came to mind. Ok be honest Joel – you just wanted to draw those balloons. Impressive work there. I too am curious about the method. Did you really draw them individually? Great work with the lens flare, it really sells the scene. Dude, those balloons and house look awesome – nice jorb! the only thing missing is tony stark hanging off the underside of the plane. maybe thats a little much. how about "STARK" on the missile? Oh noes! Joel has been seduced by LENSE FLARE!! I know your hero JJ Abrams is enamored with lense flare but resist the temptation Joel! actually they decide which ones they think will sell best. When I have a new design they get first right of refusal since their audience is much bigger than mine. In other news, the picture of everyone's favorite Kratos impersonator has appeared once again at GameSpy in their coverage of the new GoW III. Right. No more HE at work. It just involves a lot of people turning round to glare at me as I laugh out loud (I'm not saying it). Fantastic work again, Mr. Joel. With a lot of comics I've seen the humor and dedication to the work deteriate over time, but here it just keeps getting better. Keep it up! One: Bogey Nights was an episode of Strangers With Candy. Two: Isnt' that the symbol for the Masons on the uniform? I think the joy of any Pixar movie is that the previews always give you just a little bit of idea about it but leave the rest for you to see. This increases the joy.